Home Companies Sheng En Yikai Ironware Co.,Ltd. 3. Glass panel: The glass panel in our products, unless otherwise noted, are 5/8" insulated dual-pane energy conservation. All glass is tempered for safety and building code compliance. We have clear glass, sandblast glass, rain glass, Flemish glass, aquatex glass for you option. 5. All doors are fully insulated with poly foam and weather striping around door jamb and glass panel to ensure a positive seal. 6. 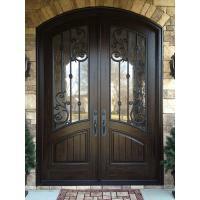 All doors are pre-bored with 2 -3/8" back set, 2-1/8" borings and 5-1/2" center to center. 7. All doors are pre-hung, jamb are equipped with mounting tab to secure jamb.